Elizabeth Warren spoke in Cedar Rapids, Iowa, on Sunday. CEDAR RAPIDS, Iowa — Lock him up? 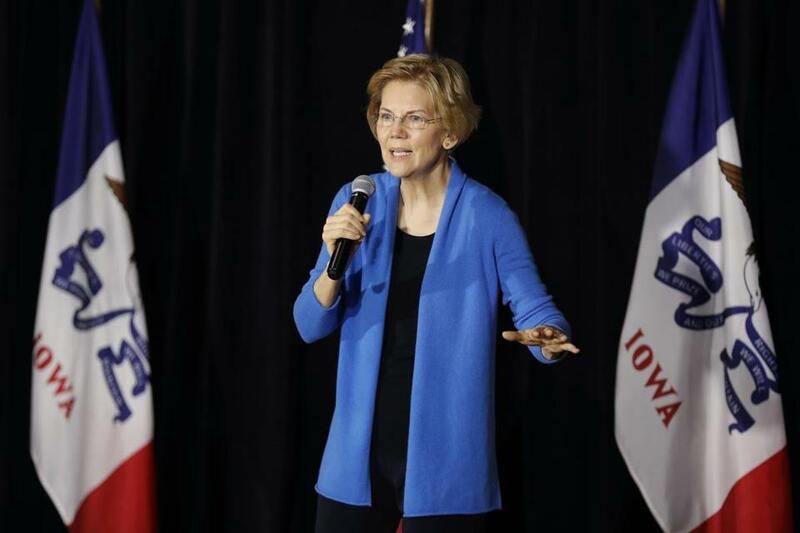 Elizabeth Warren hinted Sunday that Donald Trump may be behind bars by the time the 2020 election rolls around, as part of an explanation to Iowa voters of why she has largely been ignoring his Twitter taunts. The direct jab at the president came a day after Trump mocked Warren’s official presidential announcement in Lawrence on Saturday. Trump appeared to make a joke about the Trail of Tears — the US government’s forced and deadly relocation of thousands of Cherokee and other native tribes — while mocking Warren’s past claims of being Native American. Just a month earlier, Trump had referred to the massacre of unarmed Lakota at Wounded Knee to similarly poke fun at Warren’s candidacy. While Warren used to go toe-to-toe with Trump, calling him a “small, insecure money grubber” and a “loud, nasty, thin-skinned fraud” during the 2016 election, she is now more likely not to say his name at all. 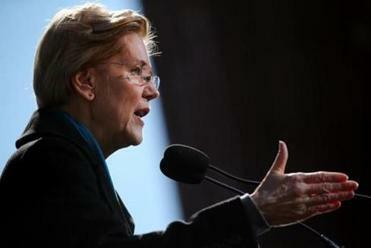 Warren, like many of the other candidates in the ever-expanding field of Democrats running for the 2020 nomination, has made the calculation that insulting Trump does not translate into votes. Warren argued the answer should be no, because Trump may soon find himself in prison — a reference to Special Counsel Robert Mueller’s ongoing investigation into possible ties between the Trump election campaign and Russia and other probes. Speaking to reporters later in the afternoon, the Massachusetts senator said she wanted to explain to voters why she didn’t respond to the president’s every insult. Trump’s frequent attacks on Warren — he’s tweeted about her more than any other Democrat who’s running — put her in a difficult position. She has built a brand as a political fighter who will return a punch, but she doesn’t want Trump hijacking her message — as occasionally happened to Hillary Clinton in 2016. Crowds at Trump’s 2016 rallies often chanted “Lock her up,’’ referring to Clinton, with his encouragement. But in the eyes of some strategists, the more time that a candidate spends responding to Trump’s taunts, the less they are delivering their own message. Warren has been careful not to center her campaign speeches on opposition to Trump and often goes through a whole speech without saying his name. In her announcement on Saturday, she specifically acknowledged that economic inequality and Washington influence peddling predate the current president. Warren’s not the only 2020 candidate to publicly question whether Trump will still be standing by November of 2020. “Should I be our nominee and Trump also be their nominee — I’m not sure that he will be — you will see the toughest person standing against him,” Senator Cory Booker of New Jersey said at a campaign stop on Saturday in Marshalltown, Iowa, according to The Washington Post. For his part, Trump dismisses the Mueller probe as a “witch hunt” and insists he will not be implicated in its final report. Warren’s stop in Cedar Rapids came a day after she officially began her presidential effort. Despite the tough prison talk, Warren demurred when asked by a voter if she believed Trump should be impeached right now. “I think it’s important that we protect the Mueller investigation, that we absolutely insist that the entire report be made public when it is completed, and then we will know what to do,” Warren said. 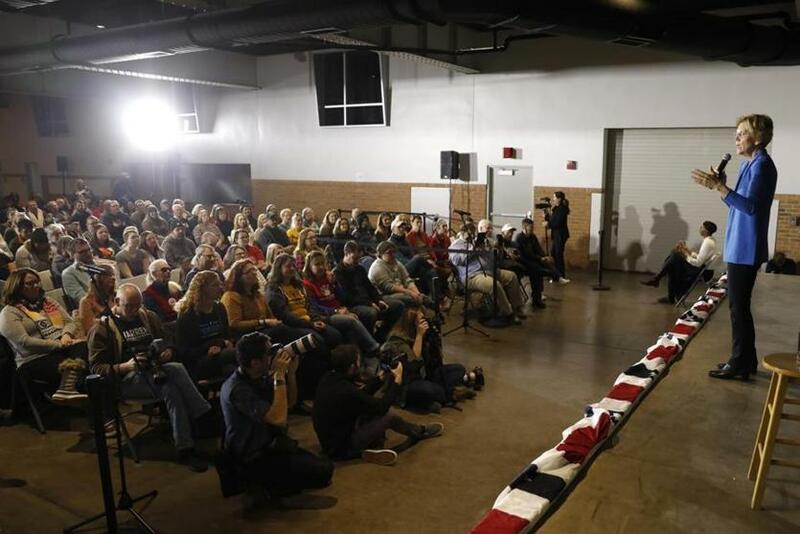 She made the remarks about Trump at the first of three events in Eastern Iowa on Sunday — her second swing through the state since announcing her intention to explore a run for presidency on New Year’s Eve. She filled up every venue she hit in Western Iowa in early January, when she was the first top-tier candidate to visit the state. Voters spilled into a parking lot outside a bowling alley in Council Bluffs, squeezed into a community center in Storm Lake, and lined up down the road in Des Moines. But in Cedar Rapids on Sunday, she drew 200 people on a snowy Sunday morning, leaving several rows of chairs nearly empty in the back of the venue. At a second appearance at the University of Iowa, Warren drew another several hundred of supporters. Her announcement in Lawrence the day before drew about 3,500 supporters. Before Warren took the stage in IowaSunday morning, a few voters brought up concerns about her past claims of being Native American. The subject wasagain in the news last week after she apologized to the chief of the Cherokee Nation and after The Washington Post published her Texas bar application from the 1980s, which showed her identifying herself as “American Indian.” Warren identified as native in the 1980s and 1990s while a law professor. A Boston Globe investigation found that her claimed background was not a factor in her hiring at Harvard or other law schools. Next weekend, Warren will continue her primary state blitz as an official presidential candidate, campaigning in South Carolina, Georgia, Nevada, and California. Liz Goodwin can be reached at elizabeth.goodwin@globe.com. Follow her on Twitter@lizcgoodwin.